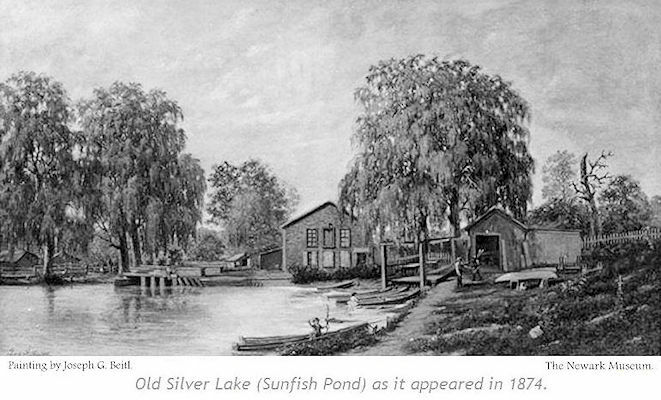 Silver Lake was a body of water that stretched from Bloomfield Avenue & N. 13th Street northeast to Heller Parkway and N. 6th Street. The lake was ½ a mile long and 300 feet wide. It came into being by damming a tributary to the Second River for the purpose of creating a mill. In 1866 the lake and property surrounding it was purchased by the Newark Ice Company to harvest ice in the winter for Newark. On the night of July 30th, 1889, a great storm broke the dam ending Silver Lake’s existence. The dam was where Heller Parkway meets N. 6th Street today, with the mill a short distance away. Ice houses were built to store the ice before it made its way to Newark. Since Branch Brook Park wasn’t in existence yet, Silver Lake was used for ice skating in the winter and boating in the summer.